﻿Mora, J. C. & Levkina, M. (2018). Training vowel perception through map tasks: The role of linguistic and cognitive complexity. In J. Levis (Ed. ), Proceedings of the 9th Pronunciation in Second Language Learning and Teaching conference, ISSN 2380-9566, University of Utah, September, 2017 (pp. 151-162). Ames, IA: Iowa State University. Mora-Plaza, I., Mora, J. C., & Gilabert, R. (2018). Focus on phonetic form and cognitive complexity in the acquisition of an L2 vowel contrast. In J. Levis (Ed. ), Proceedings of the 9th Pronunciation in Second Language Learning and Teaching conference, ISSN 2380-9566, University of Utah, September, 2017 (pp. 174-184). Ames, IA: Iowa State University. Wisniewska, N. & Mora, J. C. (2018). Pronunciation learning through L2-captioned video. In J. Levis (Ed. ), Proceedings of the 9th Pronunciation in Second Language Learning and Teaching conference, ISSN 2380-9566, University of Utah, September, 2017 (pp. 204-215). Ames, IA: Iowa State University. Mora, J. C. & Safronova, E. (2018). Foreign accent in a second language: individual differences in perception. In Wright, C., Piske, T., and Young-Scholten, M. (ed.) Mind Matters in SLA. Bristol: Multilingual Matters. 137-161. De Jong, N. H. & Mora, J. C. (2017). Does having good articulatory skills lead to more fluent speech in first and second languages? Studies in Second Language Acquisition, doi: 10.1017/S0272263117000389. 1-13. Ludwig, A. & Mora, J. C. (2017). Processing time and comprehensibility judgments in non-native listeners’ perception of L2 speech. Journal of Second Language Pronunciation, 3(2): 167-198. Mora, J. C. & Levkina, M. (2017). Task-Based Pronunciation Teaching and Research: Key Issues and Future Directions. Studies in Second Language Acquisition, 39, 381-399. Kogan, V. V., & Mora, J. C. (2017). What language sounds good to you? Researching sources of individual differences in processing unfamiliar non-native vowel contrasts. In E. Babatsouli (ed. ), Proceedings of the International Symposium on Monolingual and Bilingual Speech 2017 (pp. 168-173). ISBN: 978-618-82351-1-3. Mora, J. C. & Darcy, I. (2016). The relationship between cognitive control and pronunciation in a second language. In Isaacs, T. & Trofimovich, P. (ed.) Second Language Pronunciation Assessment: Interdisciplinary Perspectives. (pp. 95-120). Multilingual Matters. Darcy, I. & Mora, J. C. (2016). Executive control and phonological processing in language acquisition: The role of early bilingual experience in learning an additional language. In Granena, G., Jackson, D. O. & Yilmaz, Y. (ed.) Cognitive Individual Differences in L2 Processing and Acquisition. (pp. 249-277). John Benjamins (Bilingual Processing and Acquisition series). Mora, J. C. & Rochdi, Y. (2016). Phonological awareness in Spanish-English interphonology: the case of spirantization. In Fernández Planas, A. Ma. (ed.) (2016) 53 Reflexiones sobre Aspectos de la Fonética y otros Temas de Lingüística, (pp. 395-403). Barcelona, Universitat de Barcelona. Llanes, À., Mora, J. C. & Serrano, R. (2016). Differential effects of SA and intensive AH courses on teenagers’ L2 pronunciation. International Journal of Applied Linguistics. DOI: 10.1111/ijal.12151. Darcy, I., Mora, J. C. & Daidone, D. (2016). The role of inhibitory control in second language phonological processing. Language Learning, 66 (3), 741-773. Mora, J. C., Keidel, J. L. & Flege, J. E. (2015). Effects of Spanish use on the production of Catalan vowels by early Spanish-Catalan bilinguals. In Romero, J. & Riera, M. (Eds.) The Phonetics-Phonology Interface: Representations and Methodologies. (pp. 33-53.) Amsterdam: John Benjamins. Cerviño-Povedano, E. & Mora, J. C. (2015). Spanish EFLs’ identification of /i:‐I/ and phonological short‐term memory. Proceedings of the 32nd International Conference of the Spanish Association of Applied Linguistics (AESLA): Language Industries and Social Change. Procedia - Social and Behavioral Sciences 173, 18-23. Lara, A. R., Mora, J. C. & Pérez-Vidal, C. (2015). How long is long enough? L2 English development through study abroad programmes varying in duration. Innovation in Language Learning and Teaching, 9 (1), 46-57. Mora, J. C. (2014). The role of onset level on L2 perceptual phonological development after formal instruction and study abroad. In Pérez-Vidal, C. (ed) Language Acquisition in Study Abroad and Formal Instruction Contexts. Amsterdam: John Benjamins. 167-194. Valls-Ferrer, M. & Mora, J. C. (2014). L2 fluency development in formal instruction and study abroad: the role of initial fluency level and language contact. In Pérez-Vidal, C. (ed) Language Acquisition in Study Abroad and Formal Instruction Contexts. Amsterdam: John Benjamins. 111-136. Mora, J. C. (2014). Inter-subject variation in L2 speech perception and cognitive abilities. In Casesnoves, R., Forcadell, M. & Gavaldà, N. (eds.) Ens queda la paraula. Estudis de lingüística aplicada en honor de M. Teresa Turell. Barcelona: Institut Universitari de Lingüística Aplicada. 83-101. Darcy, I., Mora, J. C. & Daidone, D. (2014). Attention control and inhibition influence phonological development in a second language. In Proceedings of the International Symposium on the Acquisition of Second Language Speech. Concordia Working Papers in Applied Linguistics, 5, 115-129. Kivistö-de Souza, H. & Mora, J. C. (2014). Effects of speech rate on the intelligibility of non-native vowels. In Proceedings of the International Symposium on the Acquisition of Second Language Speech. Concordia Working Papers in Applied Linguistics, 5, 337-352. Mora, J. C., Rochdi, Y. and Kivistö-de Souza, H. (2014). Mimicking accented speech as L2 phonological awareness. Language Awareness, 23 (1-2): 57-75. For a free e-print click HERE. ﻿Kivistö-de Souza, H., Mora, J. C. (2012). Speech rate effects on L2 vowel production and perception. Anais do X Encontro do CELSUL – Círculo de Estudos Linguísticos do Sul UNIOESTE - Universidade Estadual do Oeste do Paraná, Cascavel-PR. 1-13. Mora, J. C. and Valls-Ferrer, M. (2012). Oral fluency, accuracy and complexity in formal instruction and study abroad learning contexts. TESOL Quarterly 46 (4), 610-641. Mora, J. C. and Nadeu, M. (2012). L2 effects on the perception and production of a native vowel contrast in early bilinguals. International Journal of Bilingualism, 16 (4), 484-500. Avello, P., Mora, J. C., and Pérez-Vidal, C. (2012). Perception of FA by non-native listeners in a study abroad context. Research in Language, 10, 1, 63-78. Pérez-Vidal, C., Juan-Garau, M., Mora, J. C. and Valls-Ferrer, M. (2012). Oral and written development in formal instruction and study abroad: differential effects of learning context. In Muñoz, C. (ed.) Intensive Exposure Experiences in Second Language Learning. Bristol: Multilingual Matters. 230-233. Aliaga-Garcia, C., Mora, J. C. and Cerviño-Povedano, E. (2011) Phonological short-term memory and L2 speech learning in adulthood. Poznań Studies in Contemporary Linguistics, 47 (1): 1-14. Mora, J. C., Keidel, J. L., and Flege, J. E. (2011) Why are the Catalan contrasts between /e/-/ɛ/ and /o/-/ɔ/ so difficult for even early Spanish-Catalan bilinguals to perceive?. In M. Wrembel, M. Kul and K. Dziubalska-Kołaczyk (Eds) Achievements and perspectives in the acquisition of second language speech: New Sounds 2010. Volume II. Frankfurt am Main: Peter Lang. 183-193. Cebrian, J. Mora, J. C., and Aliaga-Garcia, C. (2011) Assessing crosslinguistic similarity by means of rated discrimination and perceptual assimilation tasks. In Dziubalska-Kołaczyk, K., Wrembel, M., Kul, M. (eds. ), Achievements and perspectives in the acquisition of second language speech: New Sounds 2010, Volume I. Frankfurt am Main: Peter Lang. 41-52. Pérez-Vidal, C., Juan-Garau, M. and Mora, J. C. (2011) The effects of formal instruction and study abroad contexts on foreign language development: the SALA project. In Sanz, C. and Leow, R. P. (Eds.) The Implicit/Explicit Dichotomy in SLA and Bilingualism: Conditions, Processes and Knowledge. Washington: Georgetown University Press. 115-127. Mora-Plaza, I. & Mora, J. C. (2018) The role of cognitive attention control in L2 phonological acquisition. Paper presented at the 28th Annual Conference of the European Second Language Association EuroSLA 28, 5-8 September 2018, Münster, Germany. Wisniewska, N. & Mora, J. C. (2018) Audio-text synchronization during bimodal input exposure through L2-captioned video. Paper presented at the 28th Annual Conference of the European Second Language Association EuroSLA 28, 5-8 September 2018, Münster, Germany. Kogan, V. & Mora, J. C. (2018) Your /i/ is not my /i/: Individual differences in L1 perception and their effects on discrimination of unfamiliar nonnative contrasts. Paper presented at the 28th Annual Conference of the European Second Language Association EuroSLA 28, 5-8 September 2018, Münster, Germany. Cebrian, J. & Mora, J. C. (2018) Measuring cross-linguistic perceptual similarity by means of online tasks. Poster presented at LabPhon 16 (16th International Conference of Laboratory Phonology). 19-23 June 2018, Lisbon, Portugal. Mora, J. C. & Mora-Plaza, I. (2018) Contributions of cognitive attention control to L2 speech learning. Paper presented at the Symposium on Speech and Language. 9 June 2018, Aarhus University, Aarhus, Denmark. Levkina, M. & Mora, J. C. (2018) A focus on phonetic form during task-based communicative interaction improves L2 vowel perception and production. Paper presented at the 2018 Conference of the American Association for Applied Linguistics (AAAL). 24-27 March 2018, Chicago, Illinois, USA. Mora-Plaza, I., Wisniewska, N., & Mora, J.C. (2018) Individual differences in auditory selective attention and L2 speech perception and production. Paper presented at Bridging Attention and Prediction (BAP 2018). 6 and 20 February 2018. Universitat de Barcelona, Barcelona, Spain. Mora, J. C. (2017) The role of individual differences in the acquisition of L2 speech. Paper presented at the 50th Annual Meeting of the Societas Linguistica Europaea (SLE 2017). 10-13 September 2017, University of Zürich, Switzerland. Cebrian, J. & Mora, J. C. (2017). Crosslinguistic perceptual similarity and asymmetric lexical competition in L2 spoken-word recognition. Paper presented at AMLaP 2017, Architectures and Mechanisms of Language Processing. September, 7-9, 2017. University of Lancaster, Lancaster, UK. Kogan, V. & Mora, J. C. (2017). Which language sounds good to you? Individual biases in processing unfamiliar non-native vowel contrasts. Paper presented at the International Symposium on Monolingual and Bilingual Speech 2017 (ISMBS 2017). 4-7 September 2017, Chania, Crete, Greece. Mora, J. C. & Levkina, M. (2017). Training the production of English L2 vowel contrasts through collaborative map tasks. Paper presented at the 9th Annual Conference Pronunciation in Second Language Learning & Teaching (PSLLT), September 1-2, 2017, University of Utah, Salt Lake City, Utah, USA. Mora-Plaza, I., Mora, J. C., & Gilabert, R. (2017). Focus on phonetic form and cognitive complexity in the acquisition of an L2 vowel contrast. Paper presented at the 9th Annual Conference Pronunciation in Second Language Learning & Teaching (PSLLT), September 1-2, 2017, University of Utah, Salt Lake City, Utah, USA. Wisniewska, N. & Mora, J. C. (2017). Pronunciation learning through L2-captioned video. Paper presented at the 9th Annual Conference Pronunciation in Second Language Learning & Teaching (PSLLT), September 1-2, 2017, University of Utah, Salt Lake City, Utah, USA. Wisniewska, N. & Mora, J. C. (2017) Language dominance and inhibitory control in L3 speech production: language switching effects on cross-language phonetic interference. Paper to be presented at the Workshop on Multilingual Language Acquisition, Processing and Use 2017 (L3W 2017). 6-7 May 2017, Poznan, Poland. Mora, J. C. & Levkina, M. (2017). Exploring the role of linguistic and cognitive complexity in enhancing L2 pronunciation development through focus on phonetic form in a collaborative map task. Paper presented at The Seventh International Conference on Task-Based Language Teaching (TBLT 2017). 1-9-21 April 2017. Barcelona, Spain. Mora-Plaza, I., Mora, J. C. & Gilabert, R. (2017). Task-Based Pronunciation Teaching: The acquisition of an L2 phonological contrast mediated by task complexity and LREs. Paper presented at The Seventh International Conference on Task-Based Language Teaching (TBLT 2017). 1-9-21 April 2017. Barcelona, Spain. Mora, J. C. (2017). Individual differences in L2 bimodal input processing. Paper presented at the Workshop on Speech Perception and Production across the Lifespan (SPPL 2017), 26-27 April, UCL, London, UK. Mora, J. C. & Cerviño-Povedano, E. (2017) Processing of grammatical words in L2 captioned video: individual differences in proficiency, speech segmentation and executive function. Paper presented at the 2017 Conference of the American Association for Applied Linguistics (AAAL). 18-21 March 2017, Portland, Oregon, USA. Mora, J. C. & Cerviño-Povedano, E. (2016) Processing of function words in L2 captioned video and individual differences in executive control. Paper presented at the Symposium on Multimodal Input in Second Language Learning. 10-11 November 2016, Barcelona, Spain. Gilabert, R., Mora, J. C., Suárez, M., & Gesa, F. (2016) Aptitude memory and attention in L2 vocabulary learning through captioned video. Paper presented at the Symposium on Multimodal Input in Second Language Learning. 10-11 November 2016, Barcelona, Spain. Everitt, C. & Mora, J. C. (2016) Foreign accent imitation as L2 articulatory training. Paper presented in J. C. Mora & P. Prieto’s (coord.) symposium Challenges in L2 pronunciation teaching and learning: experimental studies. AEAL 2016. 8th International Conference on Second Language Acquisition. 7-9 September 2016, Palma de Mallorca, Spain. Cebrian, J. & Mora, J. C. (2016). Asymmetrical lexical access and crosslinguistics perceptual similarity: An eye-tracking study. Paper presented at New Sounds 2016, the 8th International Conference on Second Language Speech. 10-12 June 2016, Aarhus, Denmark. Safronova, E. & Mora, J. C. (2016). Memory and attention in the perception of L2 vowels. Paper presented at New Sounds 2016, the 8th International Conference on Second Language Speech. 10-12 June 2016, Aarhus, Denmark. Darcy, I. & Mora, J. C. (2016). Individual differences in executive function and phonological processing: implications for L2 speech acquisition. Introduction to the Special Session on Individual Differences at New Sounds 2016, the 8th International Conference on Second Language Speech. 10-12 June 2016, Aarhus, Denmark. Everitt, C. & Mora, J. C. (2015). L2 accent imitation on the L1 as a task to improve L2 pronunciation. Paper presented at The Sixth International Conference on Task-Based Language Teaching (TBLT 2015). 16-18 September 2015. Leuven, Belgium. Mora, J. C. & Levkina, M. (2015). TBLT and L2 pronunciation: current issues and future directions. Paper presented as synthesis and discussion of Gurzynski-Weiss, L., Long, A. Y. & Solon, M.’s colloquium TBLT and L2 pronunciation: Do the benefits of tasks extend beyond grammar and lexis? at The Sixth International Conference on Task-Based Language Teaching (TBLT 2015). 16-18 September 2015. Leuven, Belgium. Mora, J. C. & Ludwig, A. (2015). Non-native listeners’ speech processing benefits for accented speech. Paper presented at ISMBS 2015. International Symposium on Monolingual and Bilingual Speech. 7-10 September 2015, Chania, Crete, Greece. De Jong, N., Mora, J. C. & Fullana, N. (2015). To what extent does L2 fluency depend on articulatory speed? Paper presented at the 25th Annual Conference of the European Second Language Association EUROSLA 25, 26-29 August 2015, Aix-en-Provence, France. Darcy, I. & Mora, J. C. (2015). Tongue movement in a second language: The case of Spanish /ei/-/e/ for English learners of Spanish. Poster presented at the 18th International Congress of Phonetic Sciences (ICPhS 2015), 10-14 August 2015, Glasgow, United Kingdom. Mora, J. C. & Cerviño-Povedano, E. (2015). The effects of bimodal L2 input on the processing of function words be Spanish EFL learners: an eye-tracking study. Paper presented at Flame 2015. Using Film and Media in the Language Classroom: Reflections on Research-Led Teaching. 25-26 June 2015, Manchester Metropolitan University, Manchester, UK. Mora, J. C. & Ludwig, A. (2014). L2 learners’ intelligibility, comprehensibility and accentedness of native and non-native speech. Paper presented at the 24th Annual Conference of the European Second Language Association EUROSLA 24, 3-6 September 2014, York, UK. Llanes, À., Mora, J. C. & Serrano, R. (2014). Differential effects of SA and intensive AH courses on teenagers’ L2 pronunciation. Paper presented at the 24th Annual Conference of the European Second Language Association EUROSLA 24, 3-6 September 2014, York, United Kingdom. Cerviño-Povedano, E. & Mora, J. C. (2014). Spanish EFLs’ Identification of /i:‐I/ and Phonological Short‐Term Memory. Paper presented at the 32nd AESLA Applied Linguistics Conference, 3-5 April 2014, Sevilla, Spain. Mora, J. C. & Darcy, I. (2014). Inhibitory control and L3 phonological processing in Catalan/Spanish bilingual learners of English. Paper presented at the International Workshop on Cross-Language Speech Perception. 30-31 January 2014, Braga, Portugal. Mora, J. C. & Darcy, I. (2013). Inhibition and phonological processing in a second language. Paper presented at the 23rd Annual Conference of the European Second Language Association EUROSLA 23, 28-31 August 2013, Amsterdam, The Netherlands. Avello, P. and Pérez-Vidal, C. (2013). Phonological development during a study abroad and the role of proficiency level. Paper presented at New Sounds 2013 (International Symposium on the Acquisition of Second Language Speech), 17-19 May 2013, Concordia University, Montreal, Canada. Darcy, I., Mora, J. C. and Daidone, D. (2013). Phonological attention control, inhibition, and second language speech learning. Paper presented at New Sounds 2013 (International Symposium on the Acquisition of Second Language Speech), 17-19 May 2013, Concordia University, Montreal, Canada. Kivistö-de-Souza, H. and Mora, J. C. (2013). Effects of speech rate on the intelligibility of non-native vowels. Paper presented at New Sounds 2013 (International Symposium on the Acquisition of Second Language Speech). Concordia University, Montreal, Canada. 17-19 May 2013. Kivistö-de-Souza, H., Carlet, A., (2013). Vowel inventory size and the use of temporal cues in non-native vowel perception by Catalan and Danish EFL learners. New Sounds, Concordia University, Montréal, 17-19 May, 2013. Mora, J. C. (2012) Implicit phonological knowledge in the L2 and speech-related cognitive skills. Invited paper presented at the International Symposium on Cognitive Factors and ELT: Explicit and Implicit Teaching as a contribution in the round table “Cognitive factors: reception and production in L2”. University of Murcia, Murcia, Spain. 29-30 November, 2012. Mora, J. C. and Gilabert, R. (2012). Individual factors in utterance and perceived fluency: some empirical issues. Invited paper presented at theWorkshop Fluent Speech, Utrecht University, The Netherlands, 12-13 November 2012. Kivistö-de Souza, H. (2012). The complex nature of L2 phonological awareness: Methodological issues. V SINPEL, Universidade Federal de Santa Catarina, Florianópolis, 7-9 November, 2012. Kivistö-de-Souza, H. and Mora, J. C. (2012). 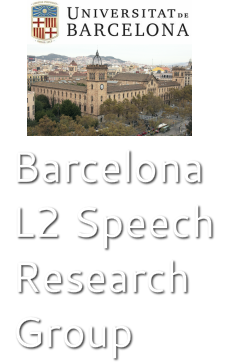 Speech rate effects on L2 vowel production and perception. Paper presented at the 10th conference of the Círculo de Estudos Lingüísticos do Sul (CELSUL X). 24-26 October 2012, Universidade Estadual do Oeste do Paraná, Cascavel, Brasil. Valls-Ferrer, M., Pérez-Vidal, C. and Mora, J. C. (2012) The development of L2 rhythm during a 3-month study abroad period. Paper presented in Howard, M. and Pérez-Vidal, C. (coord.) symposium Second Language Acquisition in a Study Abroad Context: Input, Social and Psycholinguistic Perspectives at the 22nd Annual Conference of the European Second Language Association EUROSLA 22, 5-8 September 2012, Poznan, Poland. Moya-Galé, G. and Mora, J. C. (2012). Enhancing L2 vowel perception: A study on vowel manipulation and neutralization learning effects. Paper presented at the 22nd Annual Conference of the European Second Language Association EUROSLA 22, 5-8 September 2012, Poznan, Poland. Safronova, E. and Mora, J. C. (2012). Acoustic Memory in L2 Vowel Perception. Paper presented at the 22nd Annual Conference of the European Second Language Association EUROSLA 22, 5-8 September 2012, Poznan, Poland. Mora, J. C. & Rochdi, Y. (2012). Mimicking L2-accented speech as L2 phonological awareness. Paper presented at the 11th International Conference of the Association for Language Awareness (ALA 2012). July 8-11, Montreal, Canada. Safronova, E. and Mora, J. C. (2012). Attention control in L2 phonological acquisition. Paper presented at the 30th AESLA Applied Linguistics Conference, 19-21 April 2012, Lleida, Spain. Kivistö-de-Souza, H. and Mora, J. C. (2012). Speech rate effects on L2 vowel production. Paper presented at the 30th AESLA Applied Linguistics Conference, 19-21 April 2012, Lleida, Spain. Rochdi, Y. and Mora, J. C. (2012). Mimicking foreign-accented speech as evidence of category formation for L2 sounds. Paper presented at the30th AESLA Applied Linguistics Conference, 19-21 April 2012, Lleida, Spain. Valls-Ferrer, M., Mora, J. C. and Pérez-Vidal, C. (2012). Mid-term effects of a study abroad period: a longitudinal approach to L2 fluency development. Paper presented at the 30th AESLA Applied Linguistics Conference, 19-21 April 2012, Lleida, Spain. Avello, P. (2012). The Effects of Short-Term Study Abroad on Phonological Production Development. Paper presented at the 22nd Annual Conference of the European Second Language Association EUROSLA 22, 5-8 September 2012, Poznan, Poland. Avello, P., Lara, R., Mora, J. C. and Pérez-Vidal, C. (2012). The impact of study abroad and length of stay on phonological development in speech production. Paper presented at the 30th AESLA Applied Linguistics Conference, 19-21 April 2012, Lleida, Spain. Mora, J. C., Safronova, E. and Cerviño-Povedano, E. (2012). Assessing speech-based cognitive skills: the role of attention control and phonological and acoustic memory in L2 vowel perception. Paper presented at the 2012 Georgetown University Round Table on Languages and Linguistics (GURT 2012), March 8-11, 2012. Washington, D.C., USA. Avello, P., Lara, R., Mora, J. C. and Pérez-Vidal, C. (2012). Non-native listeners’ perception of L1-accentedness in the speech of L2 learners after short-term immersion. Paper presented at the 2012 Georgetown University Round Table on Languages and Linguistics (GURT 2012), March 8-11, 2012. Washington, D.C., USA. Safronova, E. and Mora, J. C. (2012) Acoustic memory, phonological memory and attention control in L2 speech perception. Paper presented at the AAAL 2012 Annual Conference (American Association for Applied Linguistics), 24-27 March 2012, Boston, Massachusetts, USA.